New England Trails With Western Snow. Solitude management loves seniors as reflected in ticket prices and lodge access. I love skiing Solitude Mountain Resort for its wide range of trails for all levels and ages of skiers ranging from wide-open trails to steep, narrow trails that remind me of skiing Stowe, Mad River Glen, and Sugarbush. All the parking is right out front of the Moonbeam Lodge or Solitude Village. 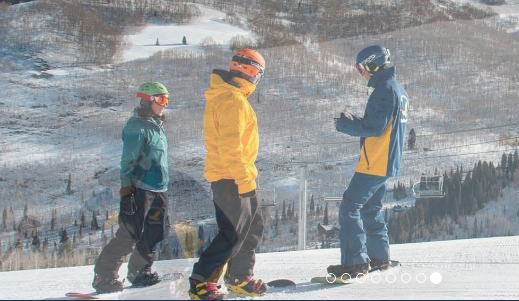 Management loves senior skiers, and it starts with when you arrive. Mid-week senior lift tickets are $75 and much cheaper if you buy on-line. Solitude opened in 1957 and is roughly 30 miles up Big Cottonwood Canyon from the heart of Salt Lake City. Like many ski areas, it has had its share of ownership changes. Deer Valley bought it in 2014 and in 2017, Deer Valley and Solitude were acquired by Alterra Mountain Company. Alterra owns 14 resorts including Aspen/Snowmass, Mammoth, Tremblant, Snowshoe, Steamboat, Stratton, and Squaw Valley. Mother Nature dumps 500 inches of snow on its 79 named runs on 1,200 skiable acres. The top is 10,488 feet and the base is 7,994 which give one 2,494 vertical feet accessible by 10 lifts. It is easy to find your way around the mountain, and you never have to climb or walk between lifts. Forty percent of the terrain is intermediate and 50 percent is rated for experts. There are two base areas—Solitude Village and Moonbeam—and, if you are a day skier, park at Moonbeam so you can walk up about twenty-five easy steps or take an elevator in the lodge. From the Moonbeam lift, you can yo-yo off on beginner and intermediate trails or ski to Eagle Express. It opens up glades that take you to the Powderhorn lift. Or, you can ski Inspiration, Rumble, Grumble, Stumble, Serenity, and Challenger and enjoy the steep rolling contours that both challenge and keep you smiling all the way down. I’ve skied all of them in knee-deep powder and frozen granular. No matter the conditions, after each run down you want to hurry up for more. If you like steep slopes through the trees, take Summit Express to the top. It gives you access to the far side of Honeycomb Canyon as well as a long, wonderful combination of intermediate runs called Dynamite and Mine. Or, you can traverse along the ridge and ski Parachute (you may think you need one, but you don’t) and Milk Run (i’ts not). On the mountain, the Roundhouse has a restaurant and bathrooms on entry level and upstairs. accessed by elevator. No stairs! The same for the Moonbeam base area. The menu at both Roundhouse and Moonbeam is typical ski area fare, reasonably priced (for a ski area) and tasty (trust me, I’m picky). There are restaurants in the small Solitude Village along with condos to rent. So let me repeat what I said in the beginning, I love Solitude. Every time I ski in the Salt Lake area, I spend at least two or three days there. I like SOLITUDE but lift ticket prices for over 80 could be a little more reasonable. We don’t ski like our children and grandchildren from 09:00 to 16:00.